You can think of 1, 2, 3, 4, 6 and 12 as being the ingredients that make up the number 12, but in fact they are the factors of 12. 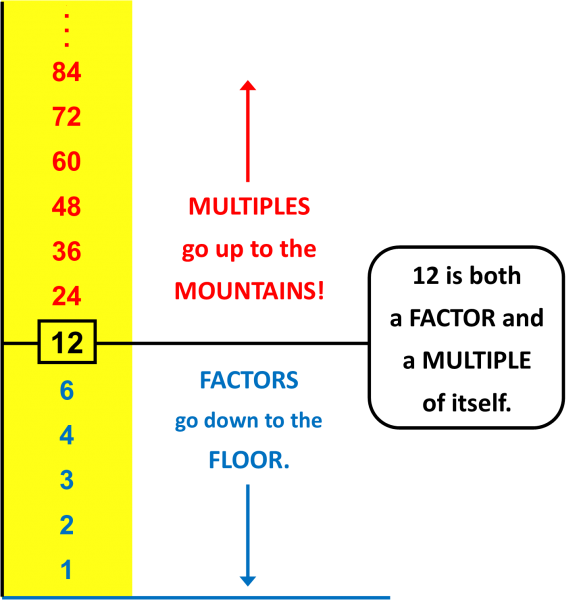 Take a look at this “Factors and Multiples” tower: you’ll see that the Factors go down to the Floor, but the Multiples go up to the Mountains (in fact the multiples keep on going forever!). The FACTORS of a number are all the integers (whole numbers) that divide into it with no remainder. The MULTIPLES of a number are the numbers in its times table. Thank you to my friends at the ATM (Association of Teachers of Mathematics) for their help in compiling this month’s blog. If you’ve enjoyed it, check out some of my other blogs and then why not try to arrange a Maths Day for your school? House Of Maths can arrange maths talks, shows or workshops for your Primary or Middle school in Dorset, Hampshire and the South.